Pakbada Muslim Maha Panchayet in Distt of Moradabad started with a speech of the then President of All India Ulama & Mashaikh Board Syed Mahmood Ashraf who welcomed the participants and said that we have reached here to claim our rights. We are not in confrontation with anyone. 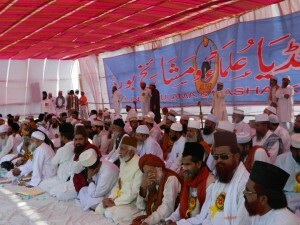 This Muslim Maha Panchayet is supposed to convey to the rulers that we are practitioners of love and humanity. We are not practicing double speak. They do this in India they claim they are Sunnis and as they reach Saudi they take pride in claiming to be Wahhabis. They have mastered the art of faking Muslim representation. 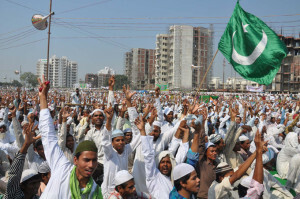 India boasts of second largest Muslim population of the world and out of this 80% Muslims are Sunnis. Even after 62 years of independence Indian Muslims are deprived of their rights and representation. They grabbed all the institutions that were historically Sunni Sufi places. Even Khanqahs and Aastanas are being governed by them while they do not sub scribe the basic practices of reverence and veneration. The Muslims who came to India can be distinguished in two simple groups. One came for political reasons, power and governance and other group came with the message of love and affection. Khawaja Moinuddin Chishti represents the spiritual side of the new comers and he injected love and compassion, humanity and coexistence in the society. We are followers of Khawaja Ajmeri R.A. he preached non violence and human compassion. A time came when we lost everything to the followers of an extreme ideology. The reasons are easier to be assessed. As long as the religious and political both the leaderships were with Khanqahs and Dargahs and Aastanas we were in better frame. Now they say religion has nothing to do with politics. This is a conspiracy to deprive Muslims from their legitimate leadership and grab their representation. He described the times and tenure of Muslim Caliphs including Abu Bakar Siddique and Sahaba kings to bring home the point that political and religious leadership was instrumental in securing rights to the community. Maulana Syed Mahmood Ashraf also dwelt on knowledge and education and went on to say that Muslims in India have gone down in education besides other fields to such a level that according to Sachhar Commission Report they are by now worse than Dalits. He appealed that everybody must ensure that he might live half fed but will not ignore education to his child. He also insisted on unity and non violence. He said that every Sunni Muslim must follow the path of peace, non violence , Humanity and social welfare. He also said that anyone can see the culture of Khanqahs, Aastanas and Dargahs which represent the composite culture of India. 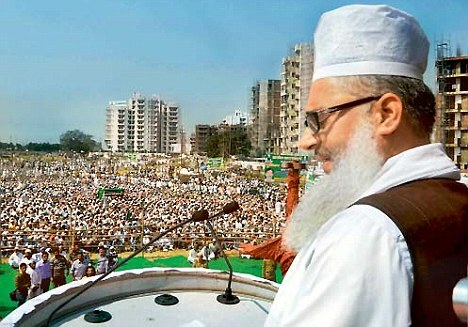 Ashraf e Millat Syed Mohammad Ashraf Ashrafi Al Jilani (the then General Secretary of AIUMB) started his speech with conviction to the constitution of India which guaranties equality, Individual freedom and opportunities for all. We cannot change the past but get lessons from it. We must acknowledge that equality, Justice and generosity are among the basic teachings of Islam. There are few peoples who misuse religion for their personal gains but any of such acts is always identified as wrong. There are some other peoples who lose everything to gain strength for the religion Khwaja Gharib Nawaz, Ghausul Alam Syed Makhdoom Ashraf Jahangir Simnani or some of them who will be remembered for their contribution to the humanity. Khanqahs have very delicate responsibilities to deliver. Khanqahs, Aastanas and Dargahs throughout India have observed that during these four decades materialism has grown much to ignore spiritualism. Khanqahs are no made to support materialism. They are not responsible to provide basic necessities of their disciples. In this background now Khanqahs have decided to take a stand in favour of supporting the disciples in all possible ways. 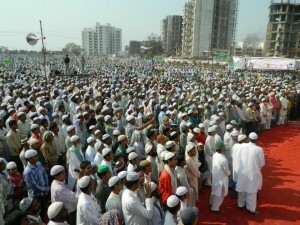 All India Ulama & Mashaikh Board is a step towards this. Now we can do it in an organized way. As Indian Muslims we have our rights that are being deny to us. 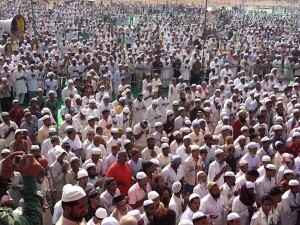 This Muslim Maha Panchayat has been organized to demonstrate that Muslims in India are facing injustice. He questioned why Wahhabis are given responsibilities to man and manage Khanqahs, Aastanas and Dargahs while they do not adhere to the practice. He said that the unity defined by Wahhabis is to remain silent in face of all aggressions and grabbings while AIUMB is committed to seek justice. 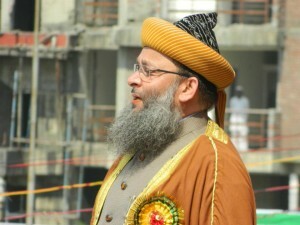 He registered his strong protest against Waqf Board and placing of Wahhabis as receivers and administrators of Dargahs. He specially mentioned Aastana of Alauddin Sabir Kalyari which has been placed under a Wahhabi receiver through Waqf Board. Having a different belief system no Wahhabi should take the position of an administrator of any Dargah. As soon as this position is disputed the Wahhabis say we are destroying the unity should I say unity through the eyes of a Wahhabi is no less than silent submission. He also questioned the silence of Wahhabis on their identity. He said a Shia never hesitates to declare he is a Shia. The same way a Sunni takes pride in calling himself a Sunni but a Wahhabi can never muster courage to declare that he is Wahhabi. He take refuge in Sunni Camp. Hazrat Maulana Syed Mohammad Ashraf Kichhowchhawi declare Wahhabiyon ki na Imamat Qabool hai Na Qyadat Qabool hai. 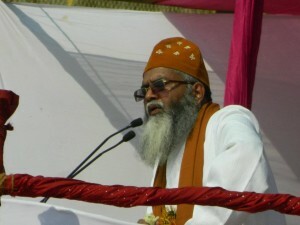 He said that Allama Fazl e Haque Khairabadi and a scholar Maulana Kifayat Husain Kafi of Moradabad and other freedom fighters have been relegated into background. We fought for the freedom and in free India we got only assurances. Political Parties are playing the same game election after election. 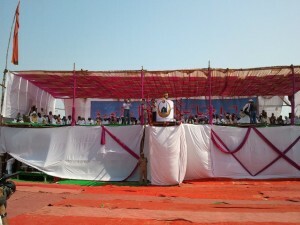 He said that through this Muslim Maha Panchayat we declare that we will go for the party that takes care of Indian Muslims. We no more need programmes we need implementation. Hazrat Syed Mohammad Mehdi Miyan Sahib Chishty (Gaddi Nashin of Dargah Hazrat Khwaja Moinuddin Chishty Rahmatullah Alyh) endorsed Syed Mohammad Ashraf and say that Sufi culture came to India more than 850 years ago and it was introduce by Khwaja Gharib Nawaz. His message of love and peace brought Lacs and Lacs of peoples into the fold of peace and tolerance. He appealed the participants to support AIUMB and make its strides a success. The demands put forward by the Board are worthy to be accepted. He said that management of Waqf properties are duly to be done according to the wishes of endower. It is a complete religious affair. No one is allowed to trample the will of the endower. Hazrat Syed Zafar Masood Sahib Kichhowchhawi, In his speech, said that general secretary of AIUMB briefed you of the memorandum that is being sent to the government of India. You have endorsed the demands. I will like to tell a few word on Muslim reservation. He also said that Indian Muslims have been deprived of their rights in last 63 years. We have been targeted by communal violence. Islam is the religion of peace. We believed in peace and coexistence. We protest religious ban on article 341 of our constitution. We will keep fighting for lifting religious ban from article 341.